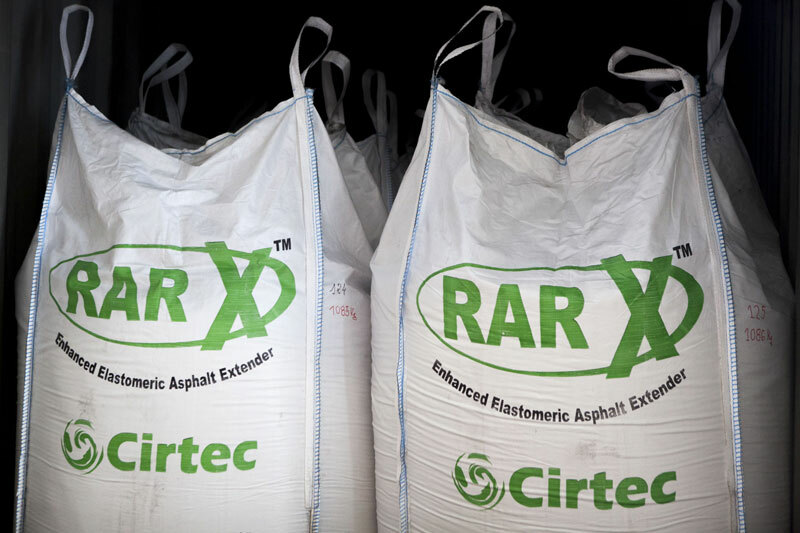 RARx is a high-tech product made from end-of-life tyre powder (60% of its composition) pre-treated with bitumen and other additives of mineral origin. 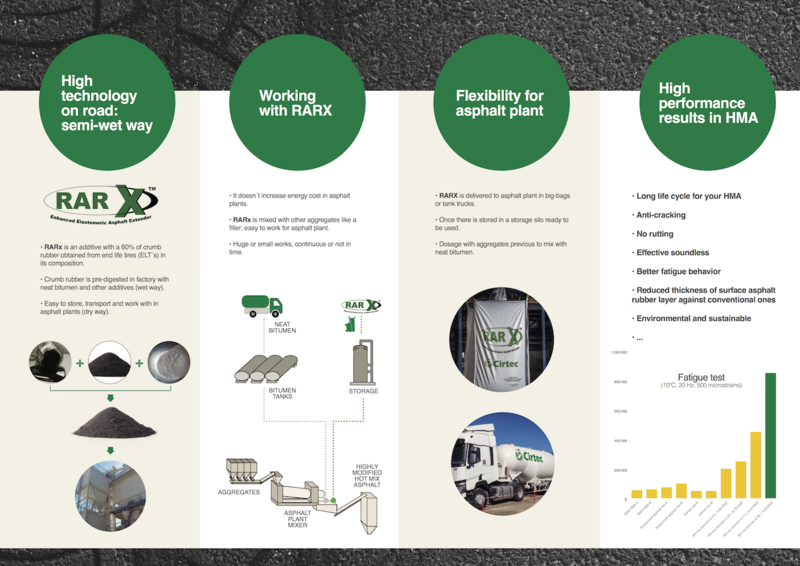 RARx marks an evolution of currently existing technologies, incorporating powdered rubber from end-of-life tyres into asphalt mixtures. The final quality of the product and the digestion of the rubber powder particles are ensured when carrying out this process at the place of origin (wet process). It takes advantage of its versatility and ease of use in asphalt-mixing plants since it is incorporated into the production process of the mixes in question as an additive or an additional fine aggregate (dry process). How do you work with RARx? The RARx is sent to the plant in big-bags or tankers. It is stored in one of the filler silos. It is dosed with the aggregates for an even distribution with them before its incorporation into the end product. In this way, the RARx allows the manufacture of asphalt mixtures of high performances for small works or actions, without energetic extra charges for the plant of manufacture of mixtures and with the versatility of being able to execute works of great or small volume, constant or discontinuous in the time. What are the advantages of working with RARx? Enhanced durability and useful life of mixes. Better performance against the reflection and permeability of fissures. Great flexibility, and absence of plastic deformation due to the use of a final mastic asphalt with a high softening point and high viscosity. Cost savings due to the design of thinner reinforcement layers. Reduced track or road surface maintenance costs owing to the increased durability of the asphalt mix made with rubber. Low noise level (sound-reducing pavement) compared to other type of mixes, resulting in better standards of living in areas with tracks or roads that have been asphalted using RARx. A reduction in the amount of raw materials necessary for the manufacture of the mix (aggregates, bitumen…), since thinner reinforcement layers can be dimensioned. Maximum use of rubber powder.